Hello everyone! This is GiGi from The Cricut Bug and I am sharing some fun Halloween treats along with a short tutorial. These are super easy to make using the Jaded Blossom Dies and they would be so cool to hand out to kids. I kept the design simple so you can whip these up in no time. 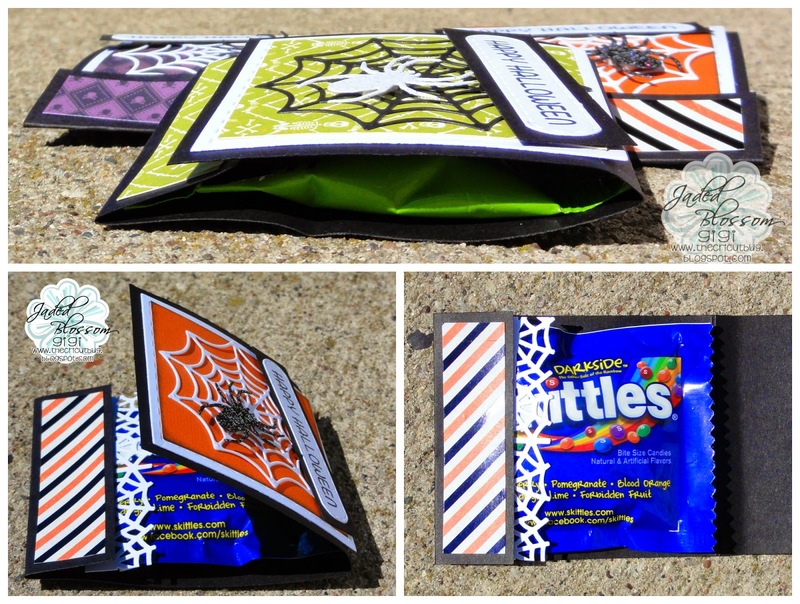 You can also change up the colors and add any kind of candy packets you wanted such as M&M's or Reeces Pieces. I chose to work with Skittles. Place your candy in the cover tucking it under the 1 inch flap. 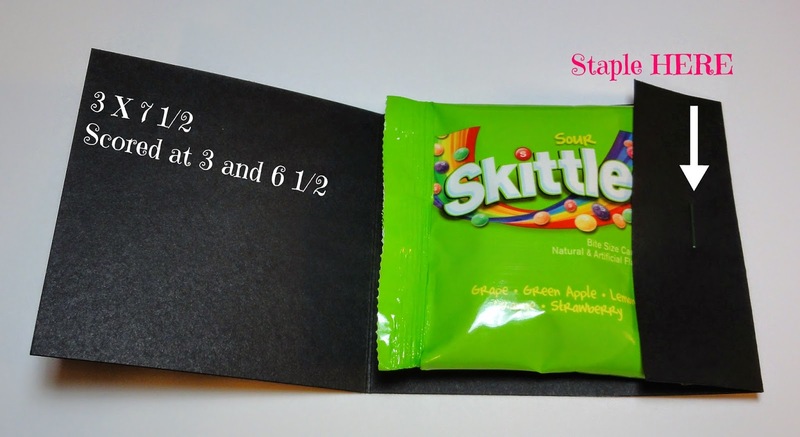 Then you will staple the flap closed catching the candy wrapper in between. Make sure to staple towards the bottom so you are able to tuck your flap in, but also make sure it's high enough so your mat piece covers the staple. Now you are going to cut your mat pieces and add the decorations. This turned out to be the PERFECT size to use with the Card Mat Dies. Cut second mat at 2 1/2 X 2 1/2 inches. Next I cut out the spiders and webs using the Halloween Dies and glued them on. 3/4 X 2 3/4 inch piece of black. The sentiment is stamped from the Halloween Candy Wraps. To finish, I added a punched web to the inside of the cover. I glued it to the candy wrapper (this way it will fit under the flap) placing it under the flap. I hope you all liked my project and have inspired you to try these for yourself! Thanks for the great directions to this adorable project. Super cute idea. Great directions. Thank you!! !